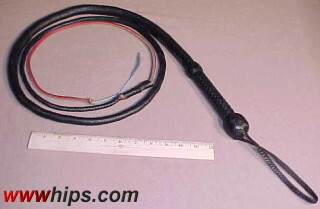 Another Indiana Jones style bullwhip, made by Bernie from EM-Brand Whips, Tasmania. 6ft/16plait thong, going downto 8plait at the fall connection. Heavy, bright red latigo fall. This whip has two plaited bellies, therefore a very smooth action and high flexibility, and is quite heavy.